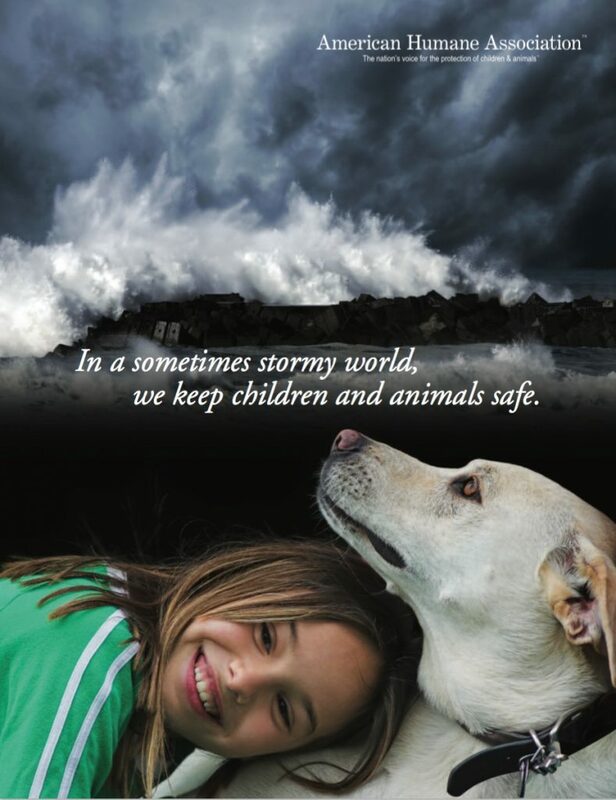 The world can be a stormy place, especially for our children and our animals. Fortunately, one organization has been there for 136 years to protect the most vulnerable among us. American Humane, which was the country’s first national humane group and pioneered virtually every major advance in child and animal welfare, was there again this past year for our kids, cats, dogs, horses, and other beloved family members. Together, over the past 12 months we have helped them weather threats from abuse to neglect, abandonment, cruelty and hoarding, the Colorado wildfires to the Colorado movie theater shootings, the continuing aftermath of the Japanese earthquake, tsunami and nuclear disaster, and the devastation of Hurricane Sandy. and happy, and attack the underlying issues that lead to the euthanization of more than 3 million adoptable animals each year. American Humane’s Children’s Innovation Institute conducted groundbreaking research to analyze and document the amazing healing power of animal-assisted therapy on children with cancer. Together, the new Institutes released a remarkable five research studies in their inaugural year. We launched two new game-changing iPhone apps for the most vulnerable, Lost Kidz and Lost Petz. We worked to help the children of military families cope with the impacts of war through animal-assisted therapy, and helped bring four- footed heroes serving our troops overseas back home so they could enjoy a safe, long and well- deserved retirement. We protected over 97,000 animals in film and entertainment with a 99.98% safety rate. And we dramatically expanded the nation’s first, oldest, and fastest-growing farm animal program, ensuring the humane treatment of a staggering 200 million farm animals. Our social impact report highlights the measurable results of our humane program efforts. But we couldn’t do it alone. Hundreds of Red StarTM Rescue volunteers and thousands upon thousands of new donors made it possible to get critically needed food, medicine and supplies to disaster zones from Brigantine, New Jersey to Fukushima, Japan. More than 100,000 people became part of the American Humane family in 2012, joining a compassion movement and an inner circle of caring stretching back more than a century. And Americans across the country rallied to take part in the second American Humane Hero Dog AwardsTM, casting more than 3 million votes coast-to-coast in a national effort designed to bring long-overdue attention and a deeper understanding to the vital, humanizing and often lifesaving importance of the human-animal bond. The world will continue to be a dangerous and turbulent place for far too many vulnerable children and animals, but with your help, American Humane will continue to be there to stand with them and help them ride out the storms of life. I hope you will join our efforts in the years ahead as so much is needed to build a more humane world – one community at a time.